Fact: The average American uses over 100 gallons of water a day. This one is something that is super easy but we forget. Turn the sink water off between brushing your teeth or washing your face. That minute you're scrubbing or exfoliating adds up quick. If you're really committed to saving momma Earth (as we all should be, re: quote above) turn the shower water off while shaving your legs etc. or time yourself in the shower. Water use really is one of the biggest things that we don't think about enough. I can attest, last year I took the "#4 Liters Challenge" in partnership with Dig Deep. You can watch the video below of the day I cut my water use to only 4 liters (or about 1 gallon). Not easy, but really helped change my perspective on where we can all cut down. Habits die hard is a commonplace saying for a reason. However small changes to your beauty routine can help your energy & resource consumption. Skip the daily hair washing and opt for Dry Shampoo more. If you're really trying to be a little more environmentally friendly, try and stay away from aerosol dry shampoos. Less hair washing will also help you cut down on blowdrying and heat styling that can eat up electricity. Another plus? This can be really great for your mane, washing too much strips hair of natural oils and causes more damage. Give your hair (and energy bill) a break a couple times a week. Another way to change up your washing routine? Try to use cooler water in the shower. Not only is it much better for your hair cuticles but about 25% of energy used by the average household is from heating up water. Try to look for your beauty product needs that have packaging you can recycle once you've used the formulas or are in glass. 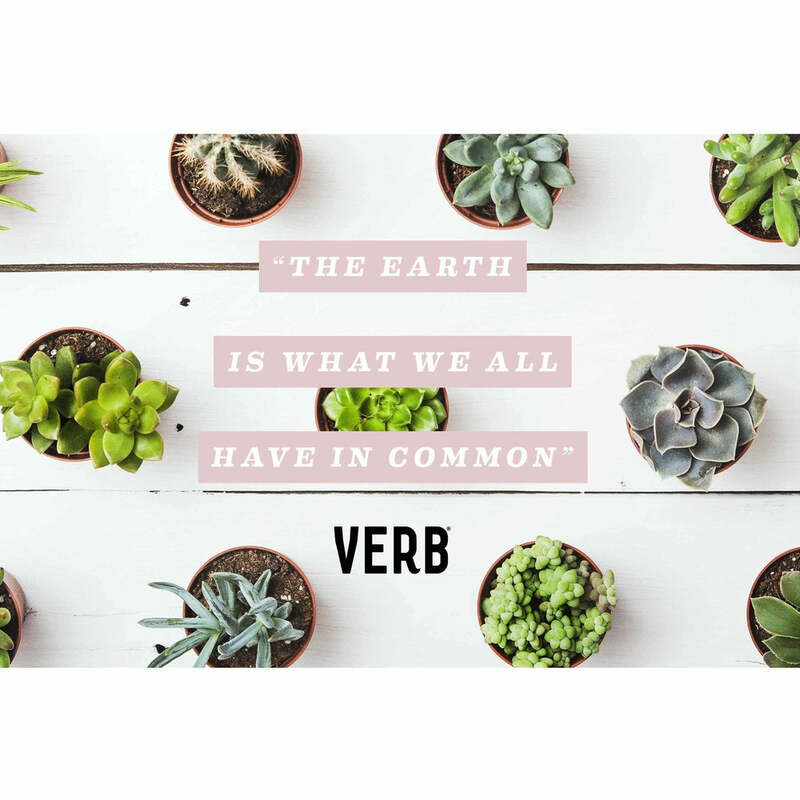 Fun fact: Verb packaging is recyclable! For those products you know you love, like Verb Hydrating Shampoo & Conditioner for me, try to buy the biggest packages. A liter bottle will save using several smaller containers, it will also save you more drives to the store or shipping & handling if you buy products online. This one may sound like a stretch but think about the millions of shipped goods a day that are being driven around the country, the gas consumption and carbon offset quickly add up. This is where you can get creative and for selfish reasons it also can save you money. A super easy one we can all be doing is using reusable bags. When you're at the gas station opt out of the plastic bag and just put that coconut water in your purse or in one of your god given carry machines, hands. In regards to beauty routine one of my favorite things to do is save glass bottles from toners etc. and re-fill them. This past week I ran out of toner and cleaned the glass bottle and now use it as the spray bottle to water my air plants. Take a look around your bathroom and beauty cabinet and realize all the ways you could re-use items. Many times we're squeezing too much soap out of that bottle or taking two paper towels instead of trying to use half of one that would do the same job. Pay attention to the amount of product you're using for things. For example - with makeup remover wipes you can easily tear them into 4 pieces and it gets the job done just as well. You use less and boom now your makeup wipes last 4 times longer! These are only a few ways you can change your daily routine, be sure to keep researching all the other small changes around the house you can make. Like instead of blasting the air conditioner maybe try opening up the window first to see if that helps, however with global warming this one may get a bit harder to do. Lastly, make sure you're having conversations about the environment. Encourage friends to make these changes and stay educated on what is happening.